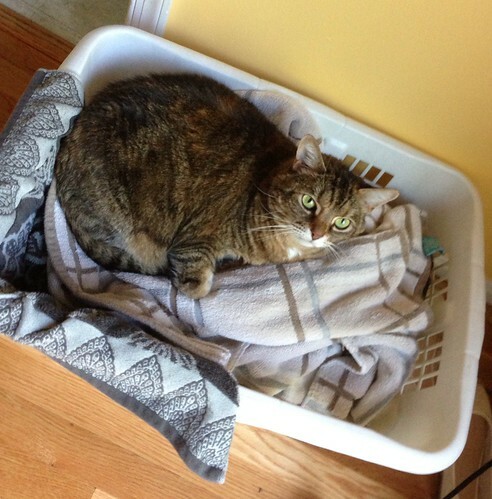 Recently I've decided I'm going to sleep in the laundry. Sometimes it's the dirty laundry, which is obviously Kristen's preference, but sometimes it's the clean laundry. Whatever. If I fits in it, I sits in it. Anyway, I thought I would share a laundry tip while I'm in here. If you find your towels are still smelling a little . . . off . . . after washing, try this: sprinkle a cup of baking soda into the wash with the dirty towels. Then, add a cup of vinegar to the rinse cycle. And voila! No more mildewy smell. And it doesn't smell like vinegar either. Just nice fresh towels. For your kitteh to sleep in.